As homeownership rates continue to fall, a new type of single-family home buyer has emerged: large corporate investors. With house values still depressed in many areas, investment funds and real estate trusts have been scooping up thousands of foreclosures across the U.S. in the hopes of managing houses the same way large real estate funds hold apartment complexes and office buildings. That trend has accelerated recently as Fannie Mae announced its first two bulk sales of foreclosed homes to investment companies, selling 94 Chicago properties and 699 in Florida to firms that have pledged to rent them for at least three years. The federal mortgage-finance giant expects to sell nearly 2,000 units, the majority of them single-family homes, to stabilize cities hit hard by the housing crisis and to lighten its portfolio of foreclosed houses, which in June numbered about 109,000. “We’re in unprecedented times,” said Don Cogsville, chief executive of The Cogsville Group, an investment company that bought the Chicago houses. Until now, his firm has focused on distressed commercial properties and multi-family housing complexes. Cogsville offered $11.8 million on the Chicago homes, putting $2 million down and agreeing to pay the rest over time by splitting rental income with Fannie Mae. What remains to be seen is how the new ownership will affect neighborhoods, and how long investment firms will stick around if prices rebound. The bulk sales have drawn some critics. 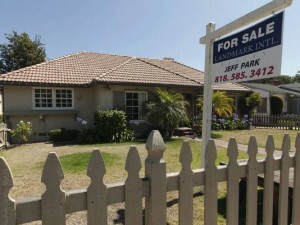 The California Association of Realtors has said Fannie Mae’s program takes ownership out of local hands and fails to publicly disclose the exact locations and sale prices of the properties bought by investors. Some also worry a glut of rentals will hurt neighborhoods. But studies show clusters of empty homes can invite crime and hurt home values. In 2011, homeownership dropped to 64.6%, the lowest in the past seven years, according to Census Bureau data. Single-family homes have steadily become a larger share of the rental market, rising from 30.8% in 2005 to 34.1% of all rental properties in 2011. About two-thirds of the nation’s metro regions saw the number of single-family rentals grow by at least 10% in the past seven years. Roughly half — including Phoenix, San Diego, Indianapolis, Detroit, Philadelphia, New York and Orlando — saw the number of owner-occupied homes shrink in the same period. Institutional investors are poised to become a bigger force in the housing market in the months to come. In September, the newly formed Silver Bay Realty Trust Corp. became the first entity to seek an IPO for its single-family-home real estate trust. It hopes to raise $287.5 million. Two Harbors Investment Corp., which spent $150 million this year to enter the single-family market, contributed its portfolio of homes to the new venture. It partnered with another investment firm to create a pool of 2,250 houses in five states by the end of August, according to a regulatory filing. That level acheterdufrance.com of spending isn’t unusual, or even that large. In June, Colony Capital officials told USA TODAY they planned to invest $1.5 billion in the single-family rental market in the upcoming year. Colony owns about 3,000 houses, and expects to own and manage 15,000 to 20,000 houses by the end of 2013, the company said. Other companies also have plans for expansion. In Phoenix, American Residential Properties President Laurie Hawkes said her company, with more than 1,500 houses in five states, hopes to take its real estate investment trust public next year. Many say the job would be impossible without sophisticated database systems and a careful eye on which properties they scoop up. Picking the right market — one with deteriorated home values, but a rosy economic outlook — also matters. Hawkes said that made Phoenix, for instance, a better market for institutional home ownership than some Rust Belt cities. Compared with renters in complexes, single-family renters tend to be older, have children and have higher incomes. Left to be seen is how many firms stay in the single-family rental business. If sales prices increase, it could cut off discount buying, and make it more tempting for companies to sell their stock of homes. Eventually, many rentals could return to owner occupancy. Census data show the largest percentage drop-off in homeownership is among those under 35. That indicates people are putting off buying, not abandoning it altogether, Ellen said.